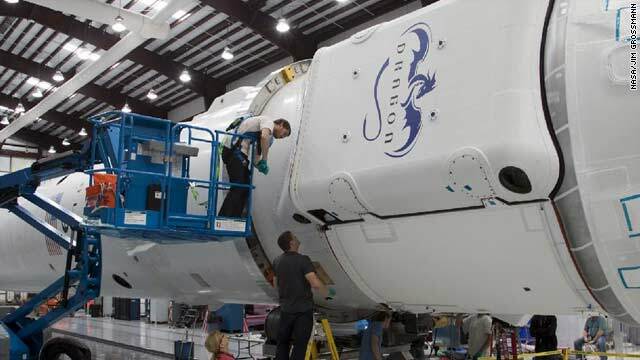 "In a processing facility at Space Launch Complex-40 on Cape Canaveral Air Force Station in Florida, Space Exploration Technologies technicians attach the Dragon capsule to the second stage of the company’s Falcon 9 rocket. Known as SpaceX, the launch will be the company's second demonstration test flight for NASA's Commercial Orbital Transportation Services program, or COTS. During the flight, the capsule will conduct a series of check-out procedures to test and prove its systems, including rendezvous and berthing with the International Space Station.